Mr. 50's is a simple man. I grew up in the nation's heartland, in the tiny hamlet of Springfield, MO. Life was good.......go to school all day, and watch TV all night (there's wasn't a whole lot of entertainment in Springfield, MO). I didn't spend much time at the opera, but I've seen a lot of live professional wrestling. So, after I was grown, I hauled outta there and moved to the big city. WASHINGTON, DC. Now I'm surrounded by the BIG TIME. Once, I saw talk show host Larry King at Macy's. Another time, I got my hair cut, and America's Hero John Glenn was in the chair next to me. This is a sweet life, baby. However, I soon noticed that my keen skills developed in the heartland gave me a competitive edge in the Ghoul Pool. In the midwest, life is dangerous. If you're not dodging tornadoes, you're getting frostbite when the wind chill is 20 below. There's not a lot of time for any foolishness. So, as I walked around the streets of THE BIG CITY, spotting celebs right and left, I could tell which ones were on the way out. My biggest Ghoul Pool claim to fame is in this photo. It was June 30, 1995. 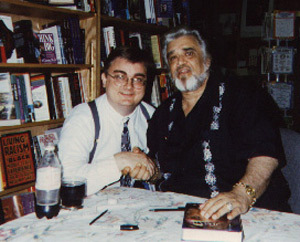 Here I am with Wolfman Jack. Just about 4 hours after this photo was snapped, The Wolfman was shakin' hands with the Grim Reaper. That's right......I saw it coming. Behold, the Wolfman's Last Photo. I am the 1996 and 1998 Ghoul Pool Champ. I am also the last remaining original member of the Ghoul Pool. Long ago, before we went global on the web, we were just a few co-workers with a notepad and a little too much time on our hands. I miss those other guys. It must be awesome to have a real life. I've had a few name changes over the years. When the pool first went "on the air" in 1996, I was undergoing some domestic unpleasantness, and so I was known as "M vs. M". Later, all that was settled, and my handle became "The Single Guy". Now, after years of pursuit by the Minor League's Luxury Woman, I have finally walked the aisle and am now back in the married ranks. The Luxury Woman is quite domestic. When she's not fixing my dinner, she's folding the laundry. It's like a 50's sitcom at my house. When I get home from a long day at the office, she's got my slippers and a cold martini waiting. I must be....... "Mr. 50's". As the longest playing member, I can garan-dam-tee you that my picks this year are a sure thing. Trust me, I'm from the midwest.